You are at:Home»Style»Style Guide: How to wear skinny jeans this autumn? 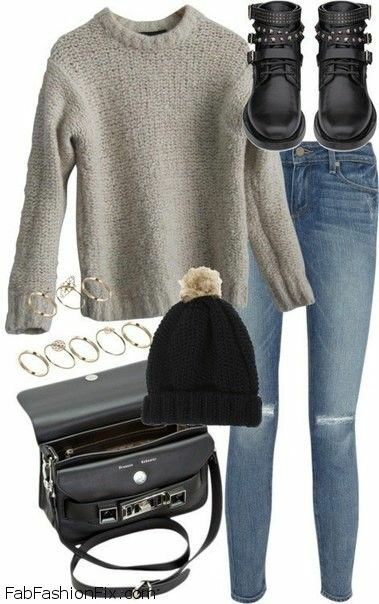 10 inspiring outfit ideas. As the autumn season has arrived, these days we are all about those key wardrobe pieces that can really make our life easier. The perfect pair of slim-fit pants or popularly knows as “skinny jeans” is always trendy and can really be worn from one season to another. Again said they are versatile, always chic and easy to find at every single price point imaginable. From casual everyday outfits to those with sporty vibe, Fab Fashion Fix brings 10 inspiring autumn outfit ideas with skinny jeans. 1. A pair of blue skinny jeans will always be trendy and go for ripped ones just to add a bit of edgy vibe to your outfit. Combine them with cozy wool sweater, a pair of black biker boots, accessorized with your favorite shoulder bag and you are good to go. 2. One of the key rules for autumn style is to layer clothes. 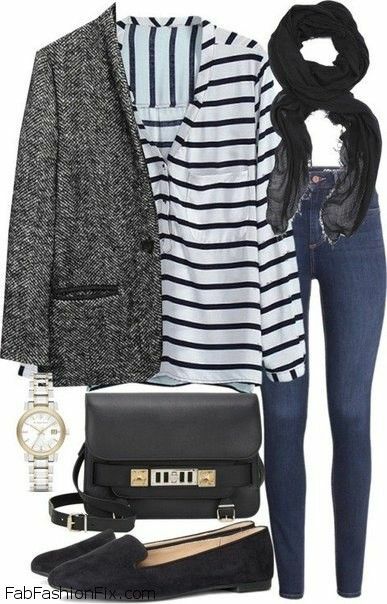 Combine blue skinny jeans with matching striped blouse and well tailored blazer. Accessorize with stylish scarf, shoulder bag and black flats. All of these colors will create well coordinated look. 3. The leather pants trend comes back each season and if you are not a big fan of those, you can easily replace them with imitation leather skinny jeans. For polished look, combine them with short coat, cozy sweater and accessorize with black suede flats and your favorite handbag. 4. 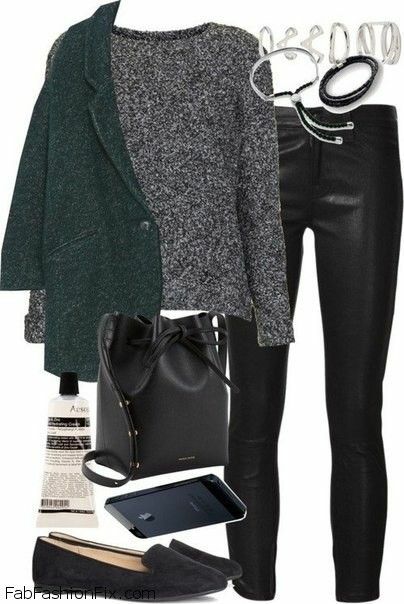 Here is another great outfit with skinny leather jeans. Combine them with elegant black short coat and striped blouse, remember that striped are always chic. Accessorize with burgundy red shoulder bag and black flats. 5. Denim on denim combination always works. 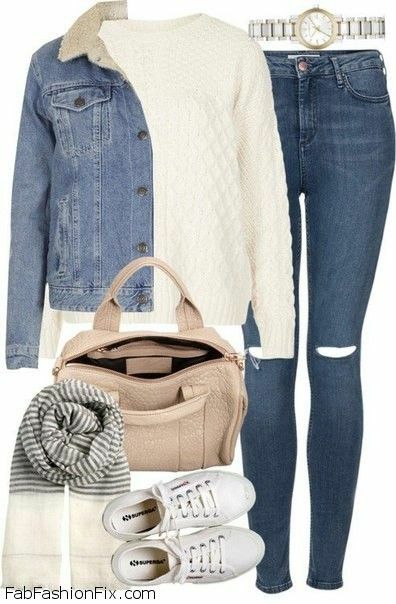 Try combining blue denim skinny jeans with denim jacket, cozy sweater and a pair of white sneakers. Accessorize with stylish scarf and your favorite handbag. 6. The leather jacket and skinny jeans combination is timeless. 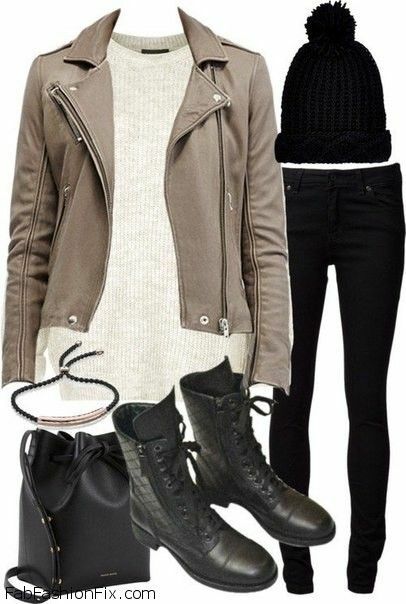 If you opt for rock chick vibe, also wear your favorite pair of biker boots, cozy beanie and stylish backpack. 7. Can we combine two button down shirts together? Yes, because the perfect white blouse can be updated by combining it with plaid shirt and black skinny jeans. Complete the look with this season trendy espadrilles and shoulder bag. 8. Sometimes the best look can be made of the two essential colors – white and black. 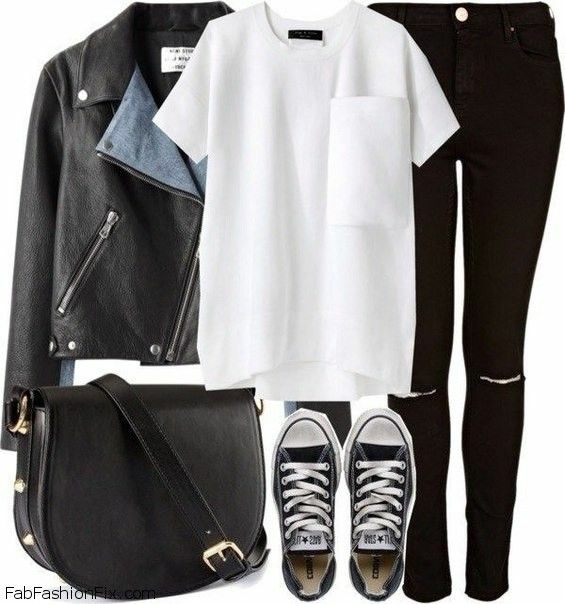 Combine black leather jacket with white T-shirt, black skinny jeans and Converse sneakers. Accessorize with stylish shoulder bag. 9. Your favorite wool sweater will always keep your warm and the turtleneck sweaters are very trendy this season. 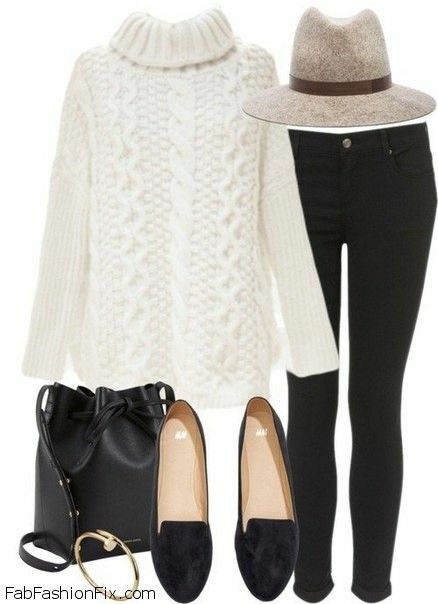 Combine it with skinny jeans, chic winter hat, suede flats and accessorize with stylish backpack. 10. Geometric prints are always a great idea when you want to refresh your outfit. 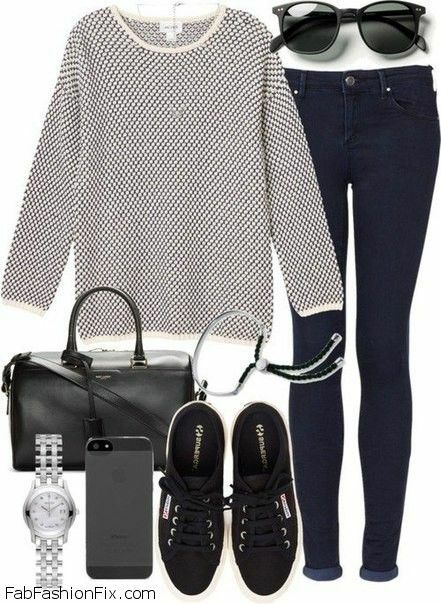 Combine geometric print blouse with skinny jeans, black sneakers and your favorite handbag.